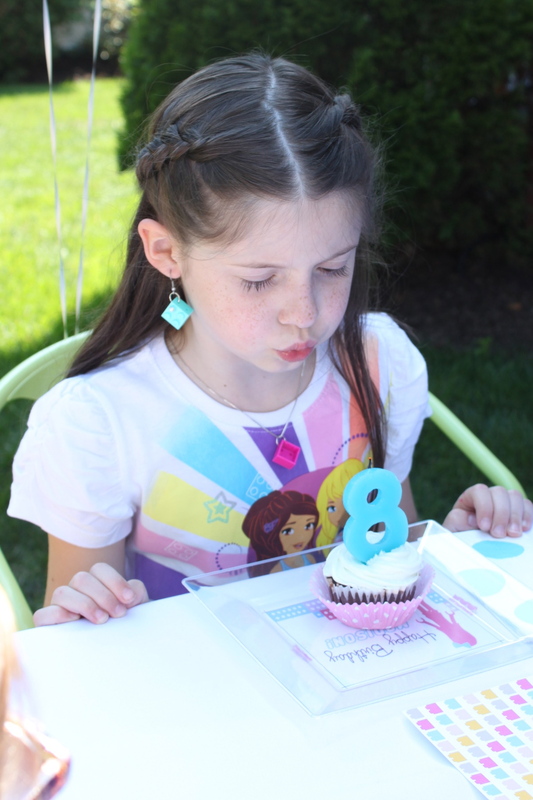 I am so excited to share the details from my daughters 8th birthday. Madison is Lego Friends obsessed at the moment. Lego Friends is a line of Legos targeted toward girls that follows five friends and their lives in a fictional town called Heartlake City. The Lego line depicts the friends’ houses, hobbies, cars, and favorite places to spend their free time. Madison was not into building with Legos until this year and the Lego Friends line has piqued her interest. She is slowly building the entire Heartlake City in her bedroom and plays with it daily. She also enjoys reading the books and watching the TV series. For this party, I chose a blue, pink and light purple color scheme. I found a printable set on Etsy and used that as the base and inspiration for the party. When planning a party, I generally start gathering ideas by creating a Pinterest Board dedicated to the theme. You can check mine out here. Next, I type out a list of everything I plan to do with the party from the guest list to the activities to the shopping list. It helps to have everything all in one place and to cross things off the list as I go. I found the original planner here and modified it for my needs. Step 1 is to plan the guest list and send invitations. 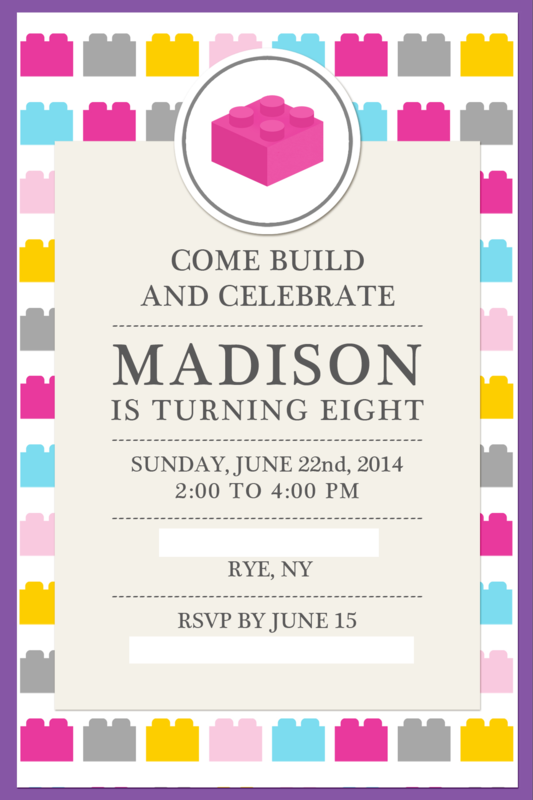 I usually let Madison invite 14 people (including herself and her sisters) because that is the max I can accommodate at home and I feel it is a manageable number of little kids since I am typically running the parties solo. 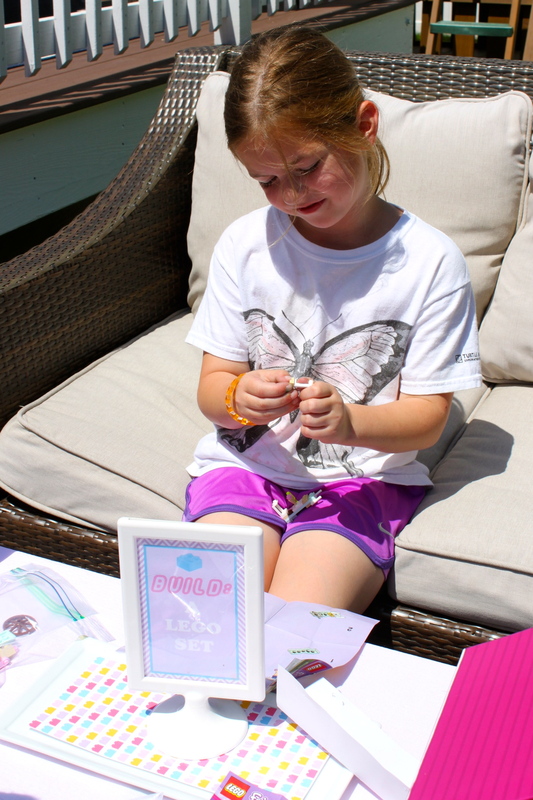 We sent these invitations a few weeks before the party. 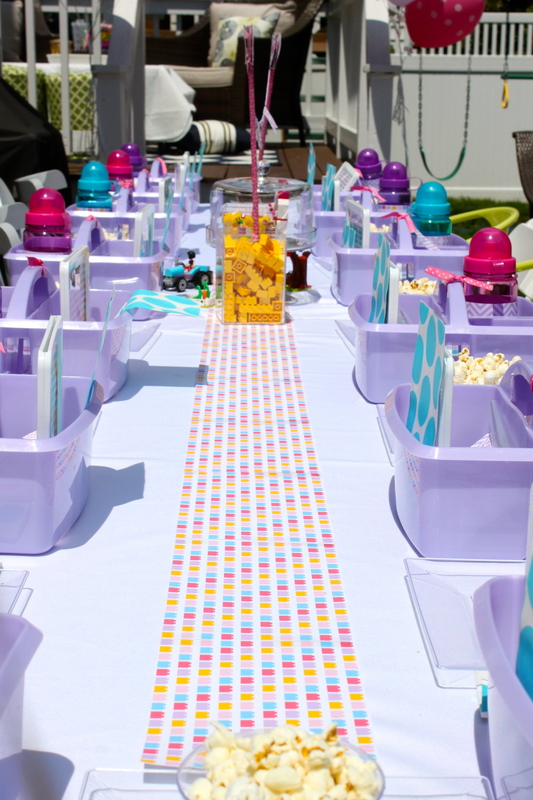 As the guests arrived they received a light purple caddy that included all the things they would need to complete the party games and activities. The plan was for them to take the caddy with them from table to table as they rotated through the activities I set up in different areas around the yard. I bought two varieties of Lego Sets for the girls to build. I found them on Ebay sold in sets of 10. I removed the sets from their poly bags and put the pieces and directions into clear bags with bag toppers from the printable collection. I found a seller on Etsy that sells Lego Friends mini-doll figure parts. I bought a set of these and put them in a tray for the girls to create their own Lego Friend. 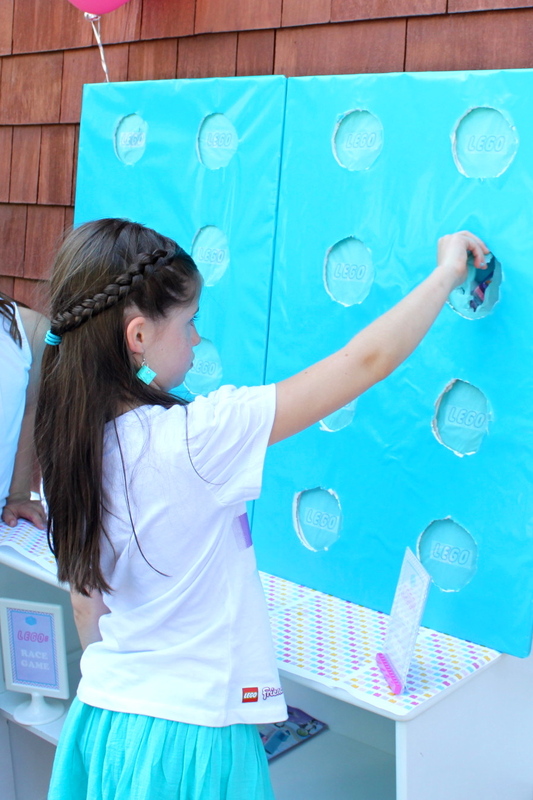 I heard many comments coming from the girls about how awesome they thought this project was. Little girls and their dolls! 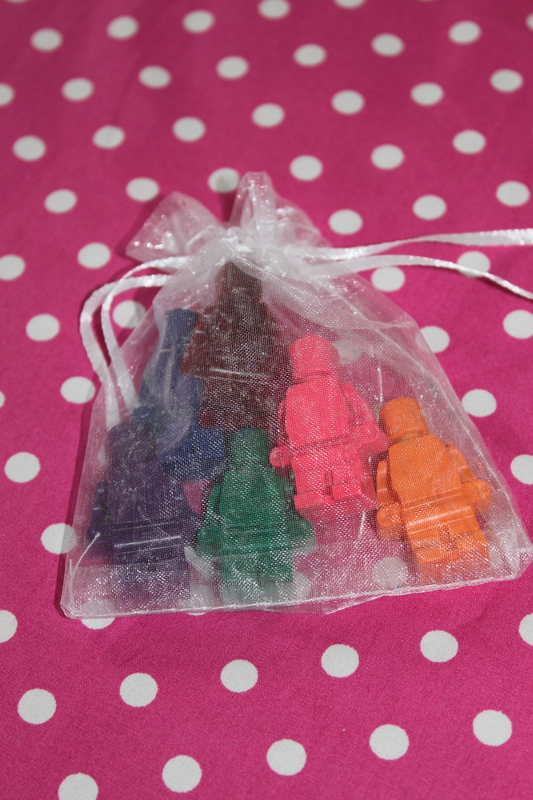 I put a pack of crayons shaped like Lego minifigures into each guests’ caddy. They are from this Etsy shop and came packaged in pretty organza bags. The girls used their crayons to color a Lego Friends picture and then got to take them home. Activity 5: Guess How Many Legos? I put a jar of Legos on a table along with post-its and pens and the girls tried to guess how many Legos were in the jar. The girl who came closest got to take the jar of Legos home! I saw the idea for this game at this Modern Lego Party. I found the clear tubing in the plumbing aisle at Home Depot. I bought a 10 foot long hose and cut it in half to create two 5 foot tubes. I filled two cups with Legos- the skinny ones fit through the tube the best. Each girl partnered up with another girl. 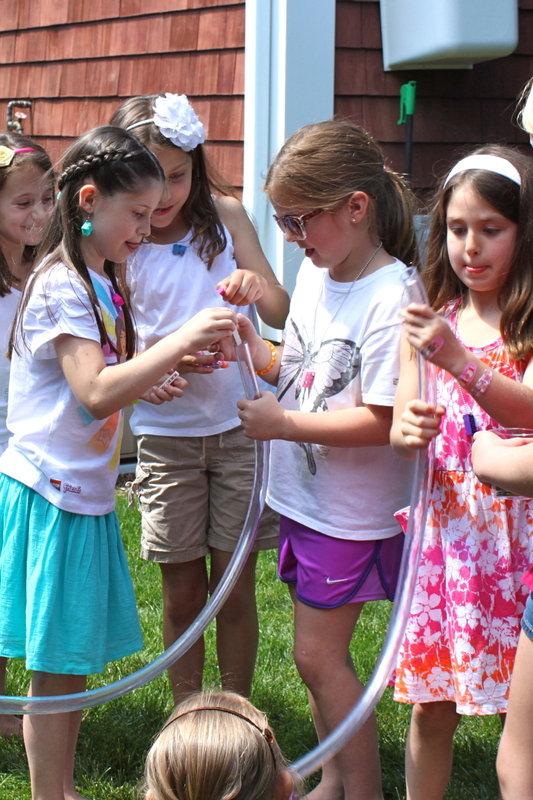 The goal was to get the cup of Legos through the tube to their partner as quick as possible. I had two teams racing one another at a time. The winning team advanced to the next round. The two winning teams faced off in a final round. The partnership that won got to pick a new Lego Friend set to take home. The goal of this game was to see who could build the tallest Lego tower. I gave them 60 seconds to grab legos and build as fast as they could. I let them keep the tower for participating and the winner won a new Lego set. Madison didn’t want a pinata, but she did want to get prizes. I found an idea on Pinterest for an alternative to a pinata called a punch box. I made mine from craft board. I cut 8 circles through the craft board using an Exacto knife, then I wrapped it in turqouise wrapping paper. I cut the wrapping paper from the circle and then placed tissue paper over each circle to create a thin layer. 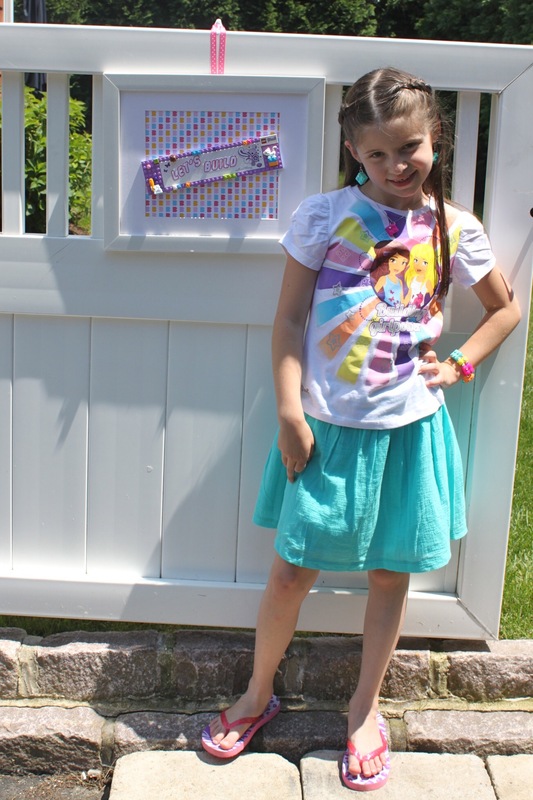 I placed prizes on the tissue paper- mostly girly things from Party City (lip glosses, body glitter, lego erasers, butterfly bubble necklaces, bouncy balls, and butterfly barrettes). I taped plastic bowls on top of the prizes to hold them in. 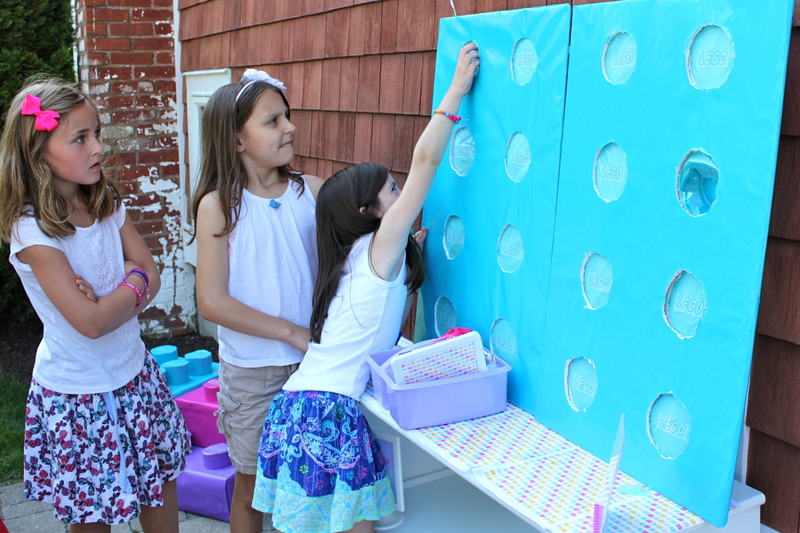 The girls then chose a circle to punch through to grab their prizes. I liked that the finished punch boards looked like Legos. 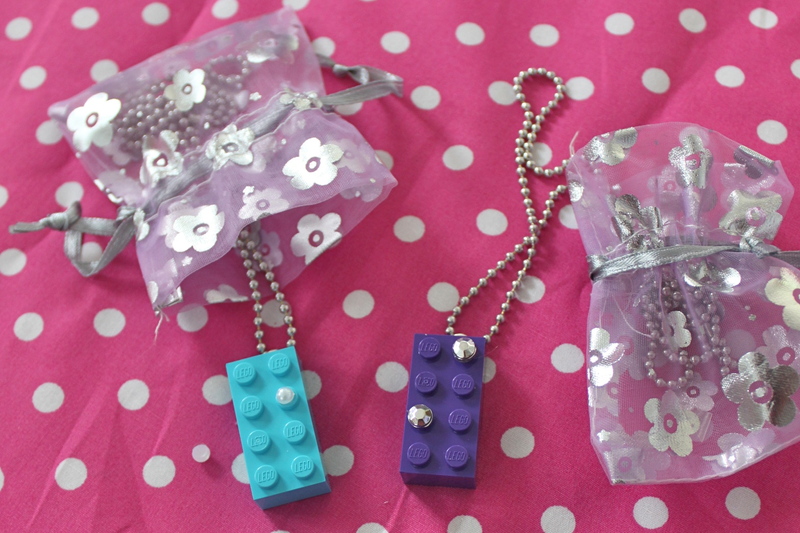 In addition to the Lego crayons, the Lego frame craft, the build your own mini-doll figure, and the Lego Friends set the girls built, they each went home with a Lego necklace. I got them on Etsy and added a little bling to each of them. Some of them got rhinestones and others got pearls. I put them in little organza bags from Party City. The girls really liked getting these. 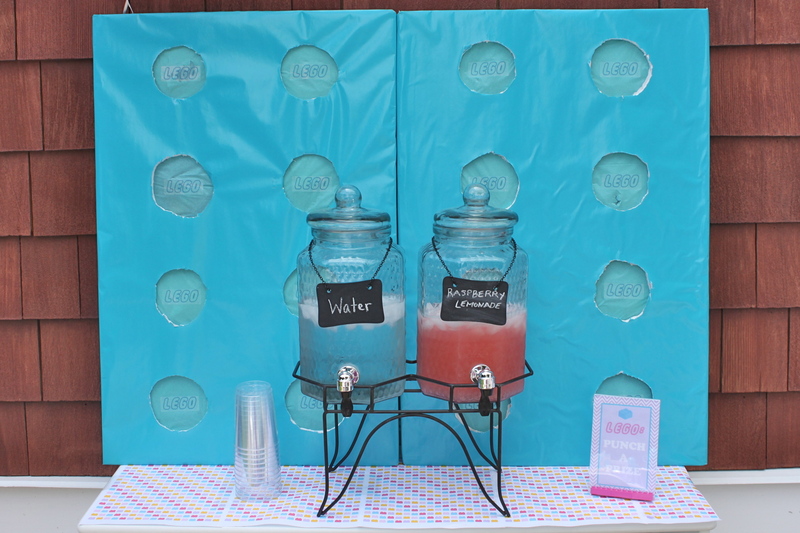 I love creating dessert tables because it is a great way to convey the party theme and colors. I always start with a backdrop for the table. 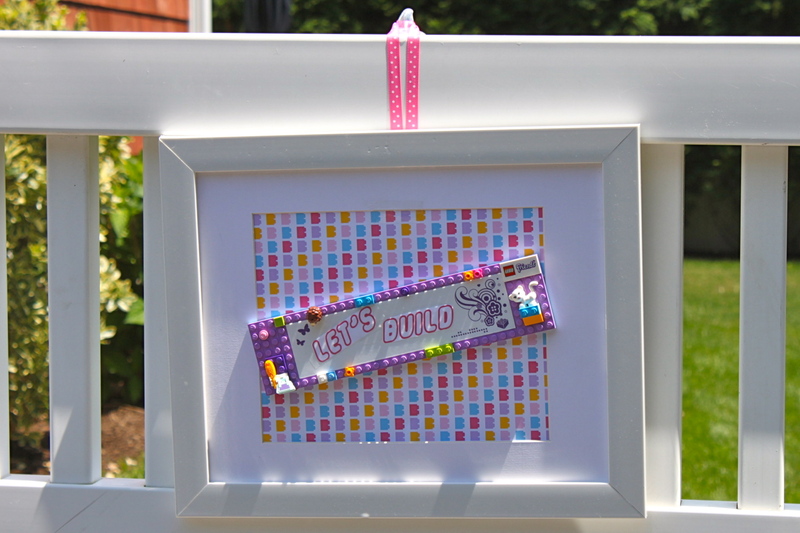 For this one, I covered craft board with pink and white polka dot fabric then I layered on square and round paper plates to mimic a large Lego Brick. 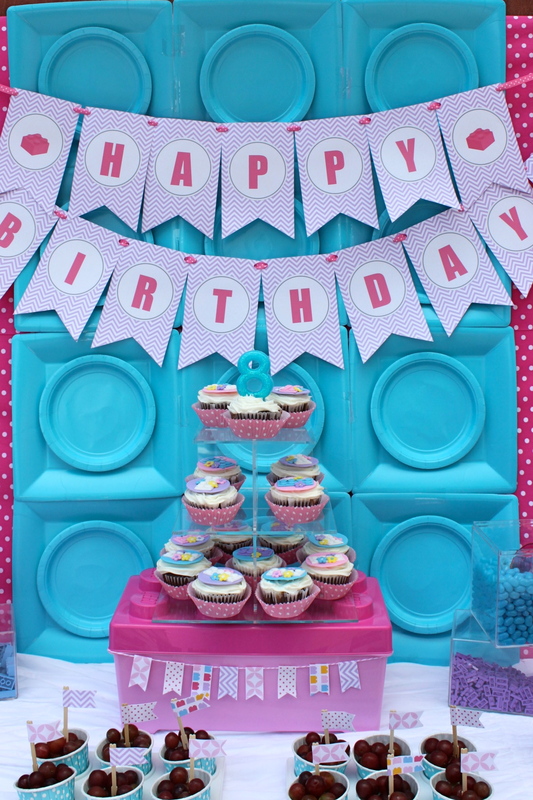 I attached the printable happy birthday banner from the printable collection to the board with ribbon. Madison wanted cupcakes so I had Lego cupcake toppers made by Carrie Budke of AngelCakes. 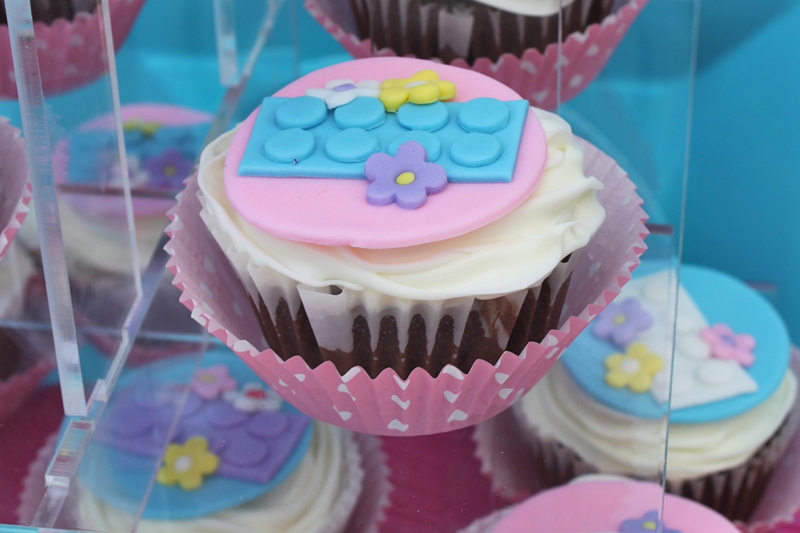 I placed them on an acrylic cake stand set atop a giant Lego box. I used various acrylic boxes filled with Legos and colored candy for the candy bar. We had purple and blue jelly beans, purple lollipops, blue candy dots that reminded me of legos, pink m&ms, and pink chocolate coins. The girls had a bag in their caddy which they were able to fill with the candy to take home. 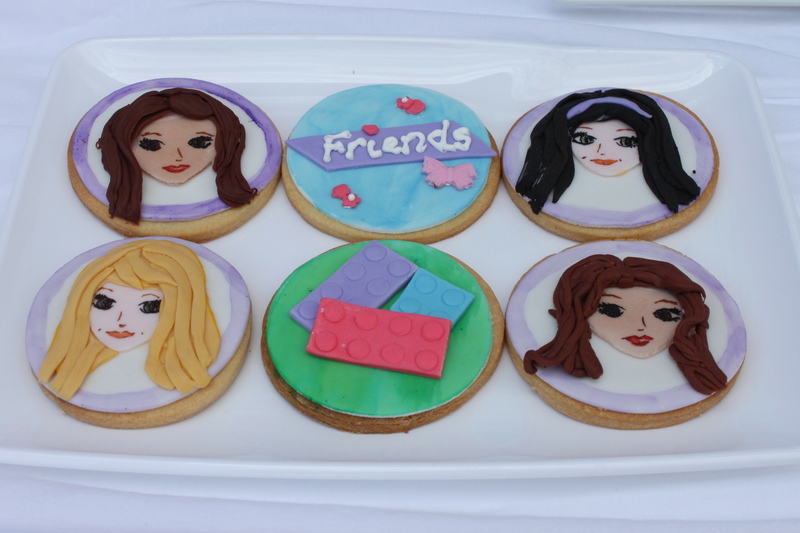 In addition to the cupcake toppers, Carrie Budke made sugar cookies with the Lego Friend characters, Legos and the Friends logo. They were darling and delicious! To combat all the sweets, I added grapes to the table. 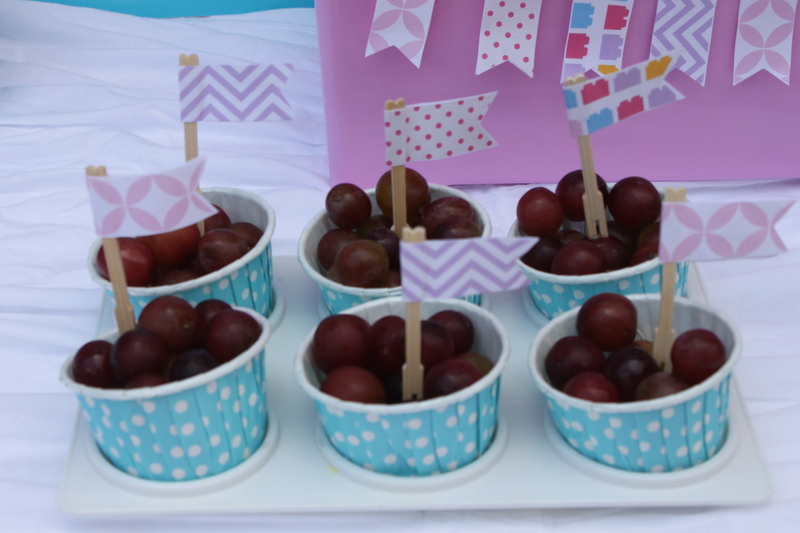 I put them in little polka dot cups and stuck in a tiny fork topped with a printable paper flag. I set a long table on the patio to fit all 13 girls. I printed Lego paper from the printable collection and attached them together to create a table runner. It was fun and colorful! I set each place setting with a clear plate that I customized by placing a Lego themed paper design underneath. 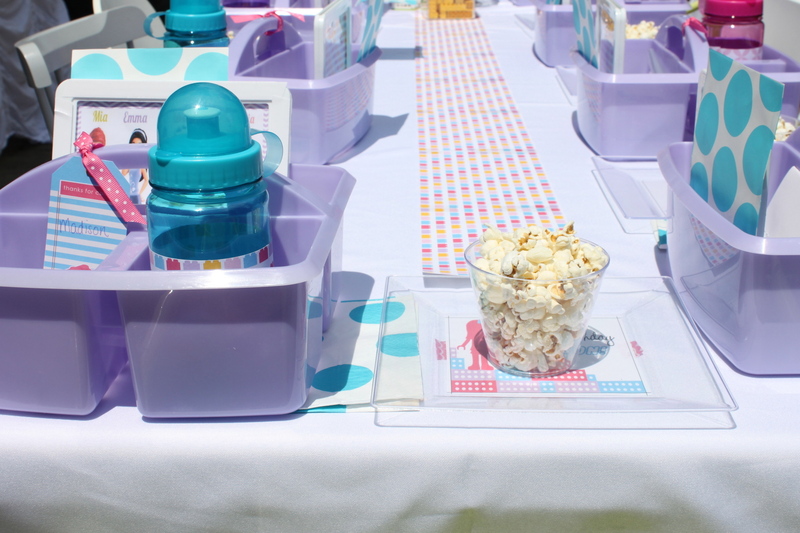 I placed a cup of popcorn on each plate so the girls could snack while they completed the activities. Each caddy also had a sports bottle for the girls to fill with either water or Raspberry Lemonade and take it along with them from station to station. 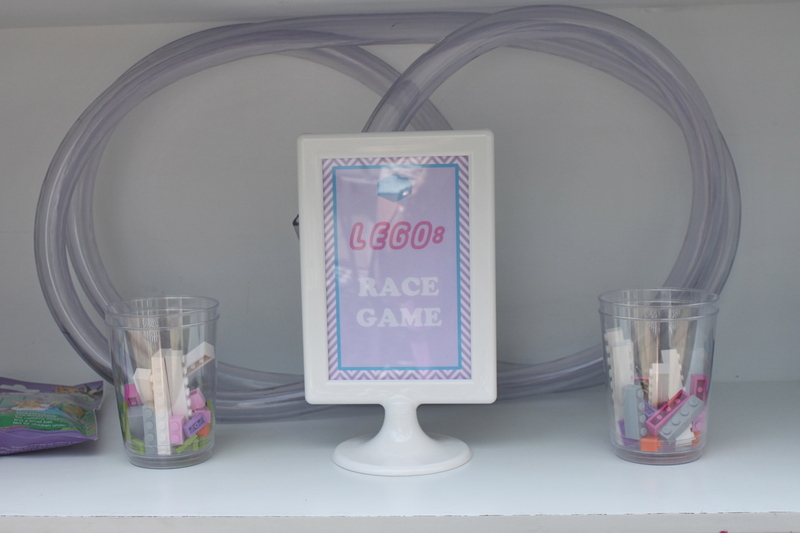 For the centerpiece, I filled two acrylic containers with Legos and made a mini banner which hung between them. I used some of Madison’s Lego Friends sets that she built to fill in the centerpiece as well. 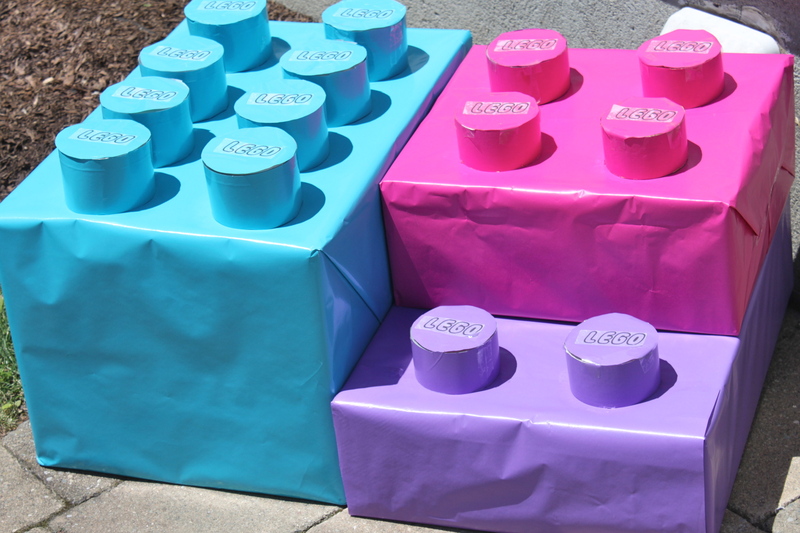 I made these giant Legos out of boxes and colored wrapping paper to fill out some empty spaces on the patio. This was such a fun party to plan and host. 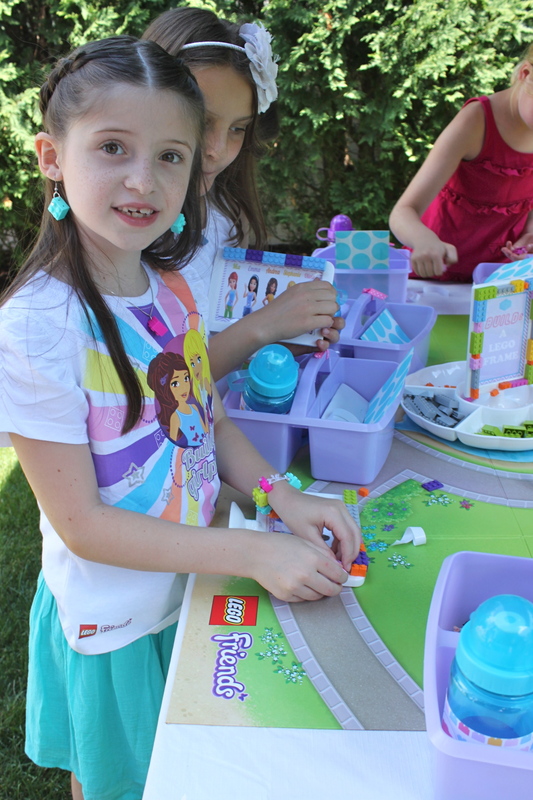 I am starting to love Lego Friends just as much as Madison! I am excited to see what eight has in store for us. Should be a fun age! Happy Birthday my super sweet and smart, Maddie girl. I love you with all my heart. love, love, love. you amaze me every time! Absolutely incredible! Once again you have created the most beautiful memories for you special girl! ❤️ Her! Hi there! 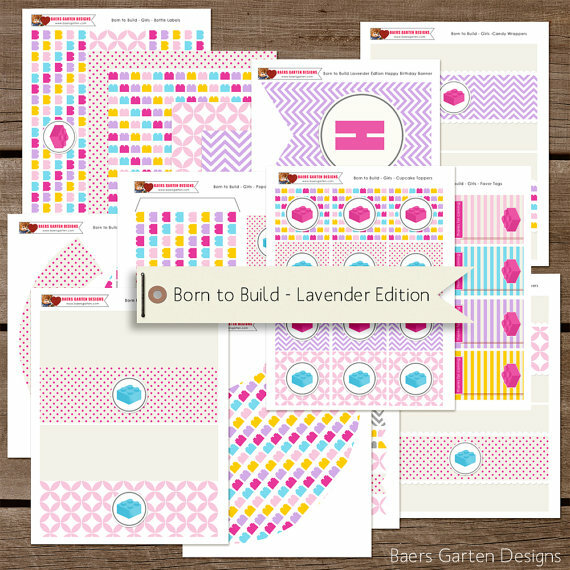 I found your site through Etsy because you linked to my shop in this post. 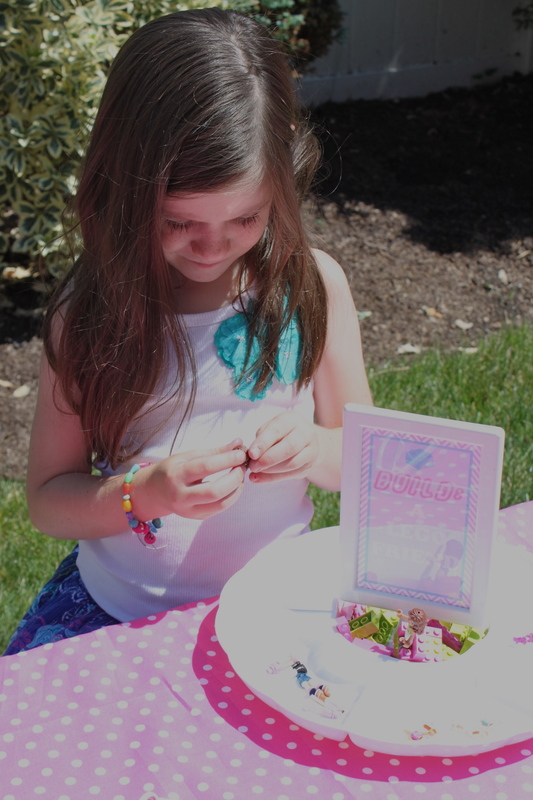 I’m so glad the girls liked the Friends minifigures and it was cool to see photos of how they were used. I actually am not selling these anymore because they have gotten quite pricey but I still sell LEGO bracelets kids can build. Anyway, thanks for mentioning my shop! Great ideas! 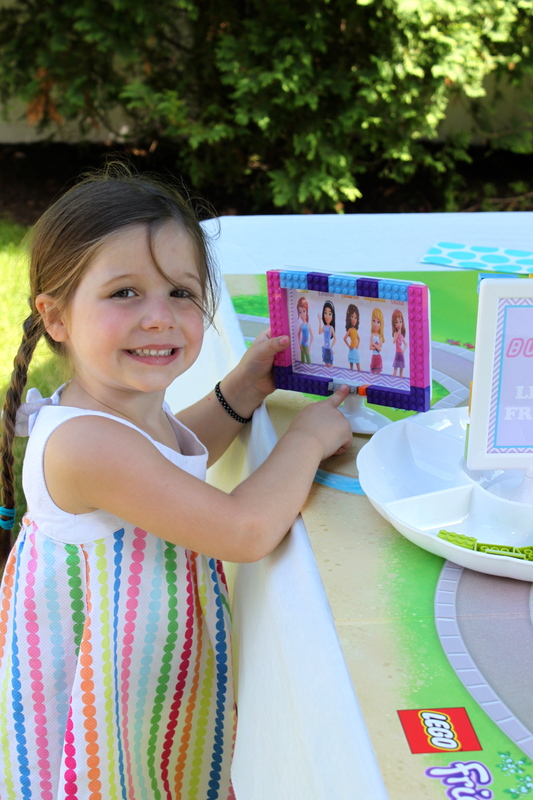 I live in Rye too and my daughter wants a Lego Friends bday party next month. I’m going to call Angel cakes now! Great ideas! Do you have the shop name on Esty where you got the doll parts? Unfortunately she is no longer selling the parts to make the mini figures. I did link to her shop in the post if you want to check it out. I love this party! 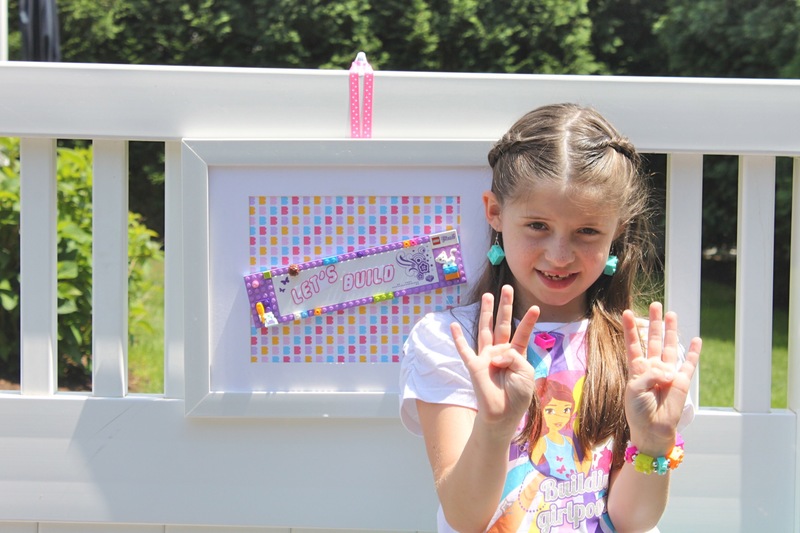 My daughter is turning 7 and she wants a Lego Friends party! Where did you find the caddies? Thanks for showing such great ideas! The caddies were purchased in bulk on Amazon. This is too cute! I love your creativity and the Lego blocks you created are awesome! Love the food table and the cute crafts! 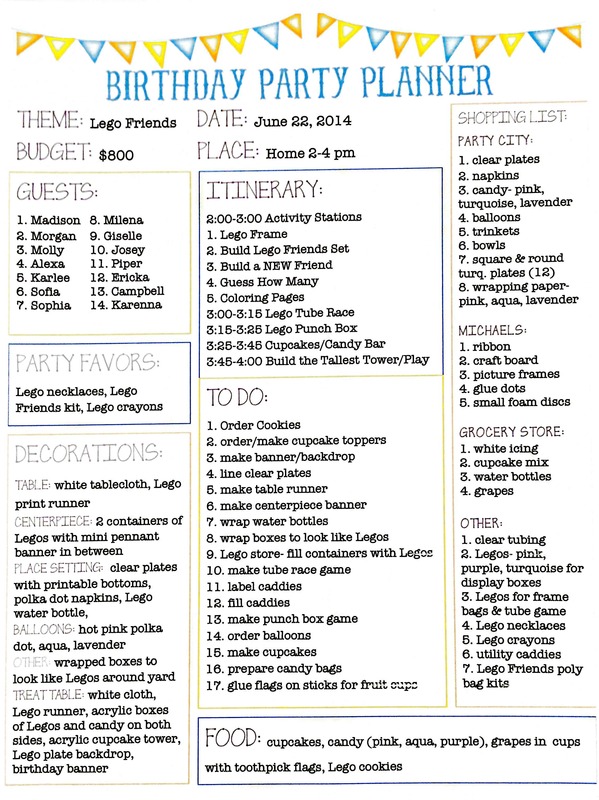 I’m planning a Lego Friends party for my soon to be 9 year old and might use a few of your ideas! Thanks for sharing! Can you please tell me where did you get the purple daddy’s ? and all the same color? I find the purple caddies in bulk on Amazon. Hey Shannon! It’s Summer Vaughn, now Bell actually. 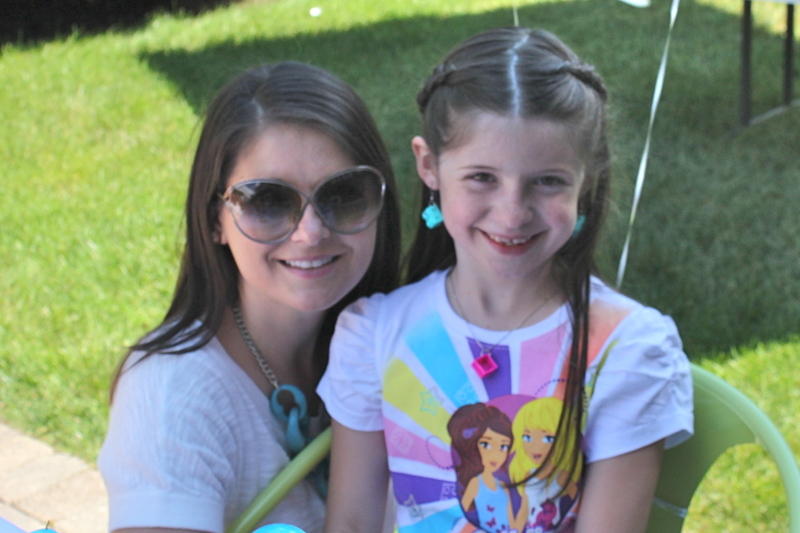 It’s so crazy that I’ve been googling Lego friends birthday party’s and here I am reading your blog and scrolling through the pictures and I get to the end and there’s a picture of you and I’m like hey I know that girl! Small world! 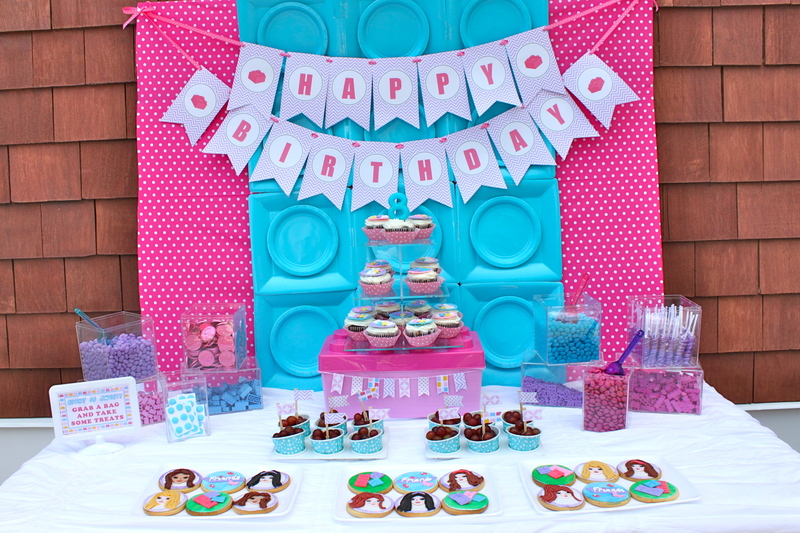 My daughter is turning five and wants a Lego friends party so I’m stealing some of your ideas! Thanks for the tips ;)). Hope you’re doing well ! This is awesome Summer!!!!! LOL! Steal away!